The Turks and Caicos Islands are in a unique and special position, in that they have the opportunity to look at what the rest of the region, and in fact all the islands of the world have done – right or wrong – and do it better. Most of the resorts in these islands have definitely developed with this concept in mind. 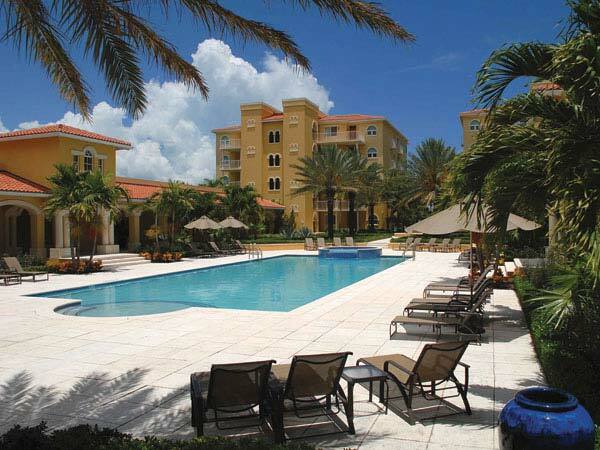 Providenciales (Provo) leads the way with luxury, condominium style properties, designed to attract the top of the line investor. 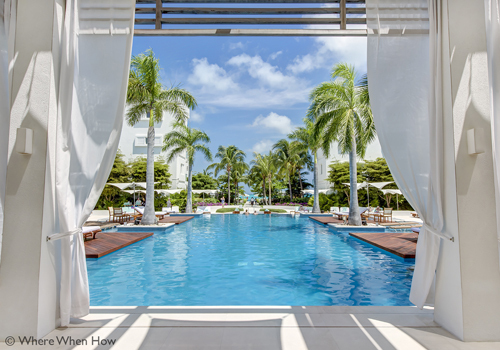 Resorts complete with five-star spas and fitness centres, infinity pools and lets not forget the view – consistently voted world’s best beach – of Grace Bay. 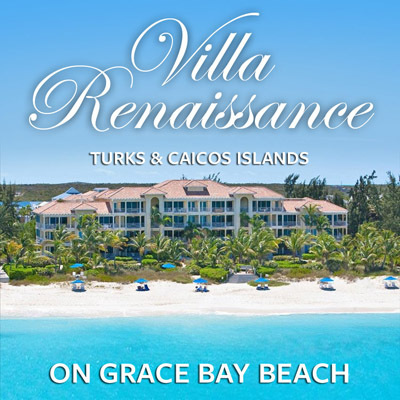 With the increase in visitors to the Turks and Caicos Islands, development has had to steadily keep pace with the growing demands of the people that make these islands their holiday destination. The islands have evolved with the goal of meeting the needs, and fulfilling the tropical dreams, of a variety of visitors travelling on every kind of budget to this ideal Caribbean getaway. The Turks and Caicos Islands still manage to retain their quaint charm and endless opportunities for rest, relaxation, idyllic seclusion, or, if desired, intense adventure and new discovery. 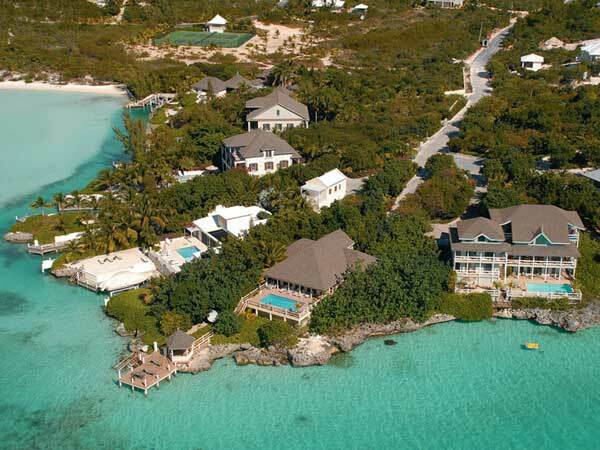 Though the islands now boast a huge and diverse selection of resorts and hotels from which to choose, visitors who come to the Turks and Caicos Islands will never feel crowded, or like they’ve been transported to another urban sprawl, like the one from which they came. Visitors to the TCI can still find their own private stretch of beach on which to watch stress float away with tranquil breezes and laid-back Caribbean island beats. 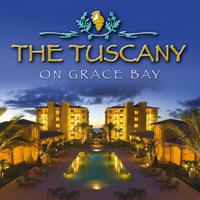 The Turks and Caicos Islands offer a fine range of accommodation for today’s discerning traveller. From the all-inclusive, where you pay for everything up-front, including taxes and tips, to quaint inns and stunning small hotels, to world-class top-end resorts, the adventurer who comes to these islands in search of a personalized Caribbean experience will definitely be able to find it. 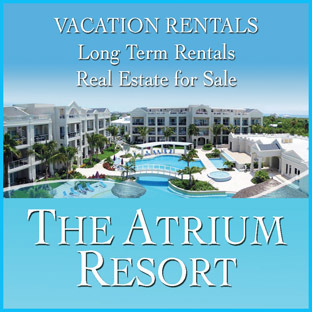 Sun-seekers will find everything from fully-inclusive retreats, to luxury resorts, condominium rentals (with even a timeshare option), and smaller hotels located in prime locations throughout the islands. 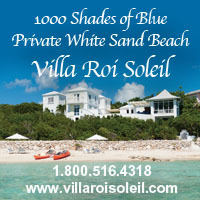 An option worth considering for your vacation is that of a private villa and guest house rental. This option is increasingly becoming more popular, particularly with larger or family groups, but certainly also for couples looking for a little more privacy when spending those precious few weeks away from the rigours of daily life back at home. Private villas and guest houses, as opposed to large hotels or resorts, can offer visitors a more individualized experience. They provide families with the opportunity to stay together in their very own houses, with all of the amenities needed for an enjoyable stay. Journeys to the properties often take visitors more off of the ‘beaten track’, allowing them to see parts of their holiday destination they otherwise would not have; and, perhaps most importantly, staying in this type of accommodation presents travellers with the opportunity to better immerse themselves in the local culture of their destination; thus, gaining a true sense of the Caribbean and of “Island Living”. Such is the case here in the Turks and Caicos Islands. 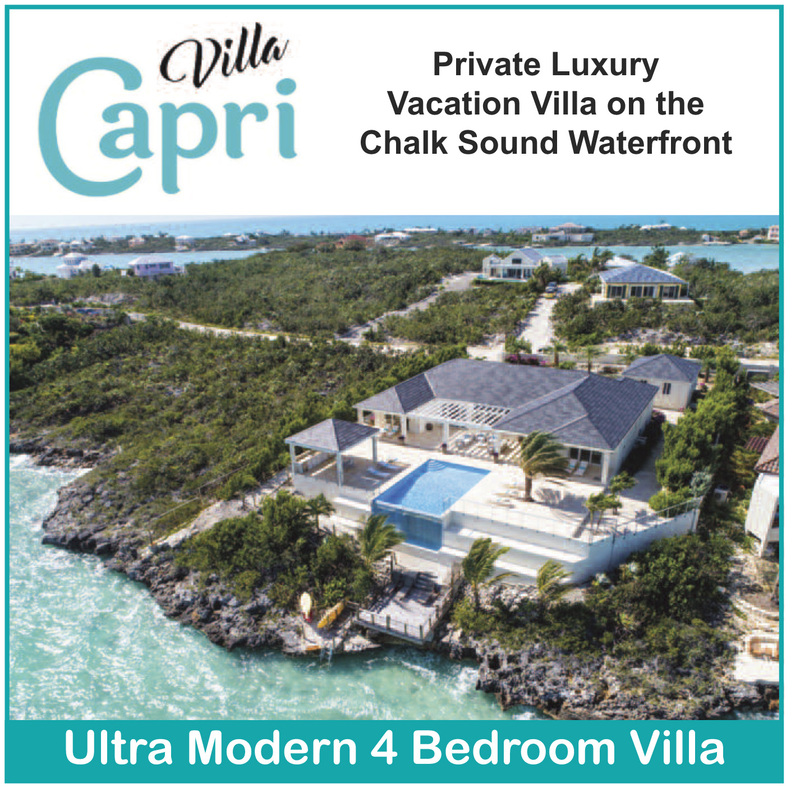 The islands of this nation have a plethora of villa and guest house rental options – each with its own uniqueness, all guaranteeing privacy and the freedom to eat, sleep and come and go as guests please. Visitors may set their own pace and their own vacation agendas. While staying in a private villa or guest house, the opportunity is there for guests to really make the accommodation their own – like a ‘home away from home’. 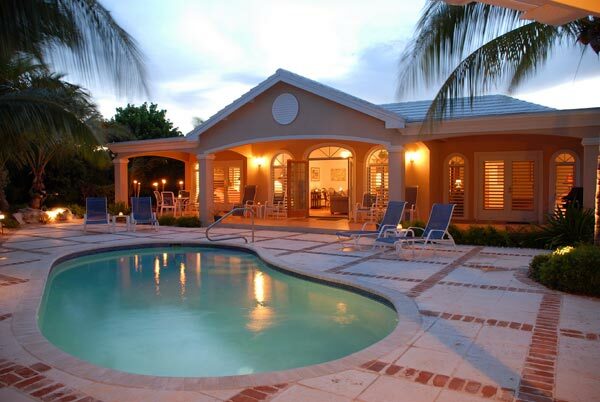 Many of the rental options here in the Turks and Caicos boast private freshwater pools, close proximity to a beach access or even beachfront locations. 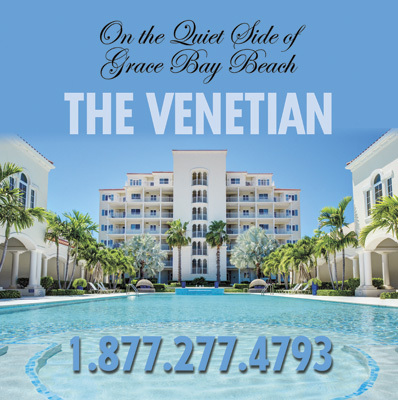 All offer fully equipped kitchens, laundry facilities, cable television and telephone services. Because the islands are relatively small, finding the way to the supermarket to do weekly shopping, or to other local shops, restaurants or excursion meeting points in a rental car or in a taxi, is quite a simple undertaking. Plus, some of the islands’ villa or guest house owners live on island, meaning they are personally available to meet the needs of their guests. 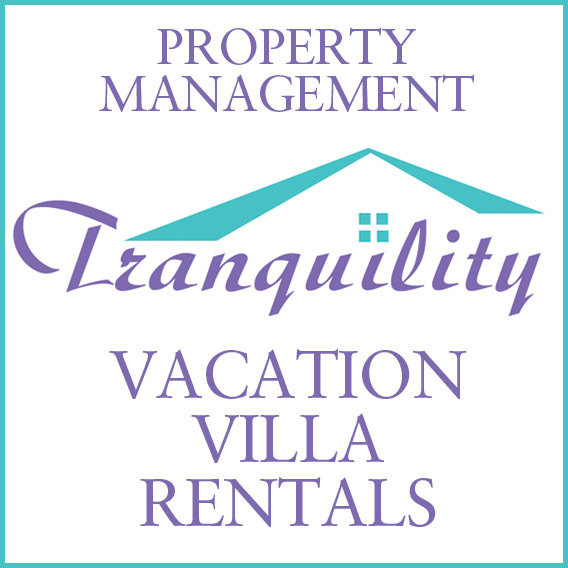 Other properties are in the more than capable hands of the islands’ reliable property management services. 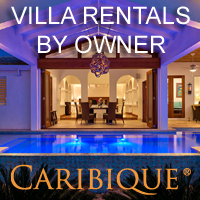 Ultimately, anyone who decides to make villa or guest house rental their accommodation choice will always have someone on-island to help them with their stay. 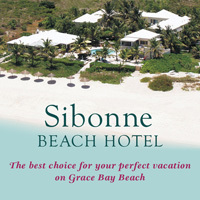 The personalized experience of a stay at a private villa or guest house can be truly rewarding. You may come to find that truly immersing yourself into Caribbean life is one of the best and most unique holiday experiences you have ever had. Take some time to set yourself apart from the crowds. Meet new friends, sample new foods, reconnect with your loved ones, and explore new frontiers. Make some unique Turks and Caicos memories that will last a lifetime. PLEASE NOTE: An 12% Government Tax is charged on ALL accommodations. The additional 10% Service Charge added to resort and hotel stays is NOT charged on villas. 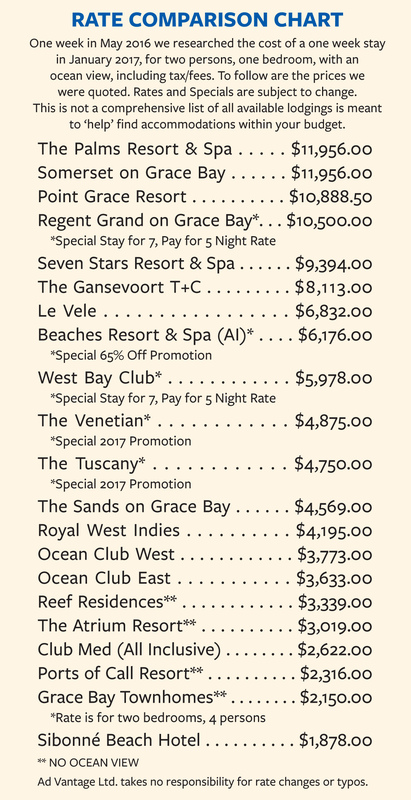 Resort Rates Comparison Chart to help narrow your choices of Accommodations — Providenciales, Turks & Caicos Islands. All Rates are subject to change at any time.